I realize the following are probably not going to be shocking revelations to a lot of you. But here's the thing: they were for me, so I'm sharing them here as part of my documentation process of this milestone event in my life. Aka: a human growing inside of me. *It shouldn't be necessary, but just in case you're new around here... This post is meant to be truthful with a touch of hyperbole. Go with it. I knew about this one. I was ready for the mood swings. "Pregnant people are crazy!" Not me. I was going to have everything under control. What I could not have prepared myself for was the ridiculously high level of hysterical behavior that appeared out of nowhere. A few nights ago I woke up at 2:00 am absolutely starving. I inhaled 2 bananas in approximately 1.56 seconds and then collapsed into a fit of heaving sobs because I woke up hungry and therefore was starving my baby and was going to be a terrible mother. "How can I feed a baby if I can't even feed myself!" I wailed while Jordan rubbed my back and tried (and failed miserably, I might add) to stifle his laughter at my insane behavior. <--I can't tell you how much I wish this was not a real story, but sadly I have exaggerated no part of this. Note to all my friends in real life: from now on, scheduling a coffee date with me means arriving with a frozen lasagna in hand. Preferably with a dozen breadsticks and also a second lasagna. Baby needs to eat. And when I say baby, I mean me. When I say I am peeing every half hour, I am not joking. It's calmed down a bit now that I'm in the second trimester, but seriously. My hands are dry from washing them so much. My bladder is the size of a poppyseed. I should probably just bite the bullet and buy a pair of Depends. At least I'm getting some exercise walking back and forth to the bathroom? I'm stretching here. Really stretching. They're real, and they're terrifying. Last week I dreamed we were out house hunting and I was bit in the knee by a rabid possum. It was bleeding and swelling, and I thought I could see the Great Light of the hereafter shining on me. I woke up whimpering and made Jordan swear we're never leaving our apartment. I told him it was sign. We recently put an offer on a house, and if I go back there and see a possum, we're pulling out of the contract. How do you begin this type of life-changing announcement? "Speaking of... actually, speaking of nothing we're talking about right now, hey I'm growing a human!" People immediately drop their eyes to your stomach as if the baby is going to pop out right then and there. And even though there might be nothing to see yet, you feel like making a sign to wear that says, "I'm pregnant" just so people don't think you've been eating too many cheeseburgers. I did not anticipate how awkward this conversation would be, and yet it is. I blame all of you. BE COOL AND STOP STARING AT PEOPLE'S STOMACHS. It's rude. Congratulations (belated)!!! So excited for you! I can completely relate to all of this. I laughed hard at the waking up starving, eating 2 bananas, and crying about being a terrible mother. There may or may not have been an incident a few months ago when I splashed my stomach with 3 drops of boiling water while draining broccoli, convinced myself that I had given my baby third degree burns and cried for an hour because I was sure I'd be a terrible mother. Crazy mood swings. P.S. Three drops of boiling water on your skin wouldn't scar your baby for life. Trust me, I called my doctor. Pregnancy paranoia is real! Part of the reason I'm so excited that you're preggo is that everyone else in my blog feed that is expecting is all, "I'm growing a miracle and it is magical and I am so happy and fulfilled" ALL. THE. TIME. And I know that you will write about the hilarious and not so magical things. So cheers to you. The pee is no joke. I've been telling Jim for months I'm going to be in a diaper before this is all said and done. Hahaha you crack me up. I already pee a lot so not sure what that means for my future. I just know I'm going to enjoy your pregnancy stories :) Do you read http://michellesncheese.blogspot.com/ ? 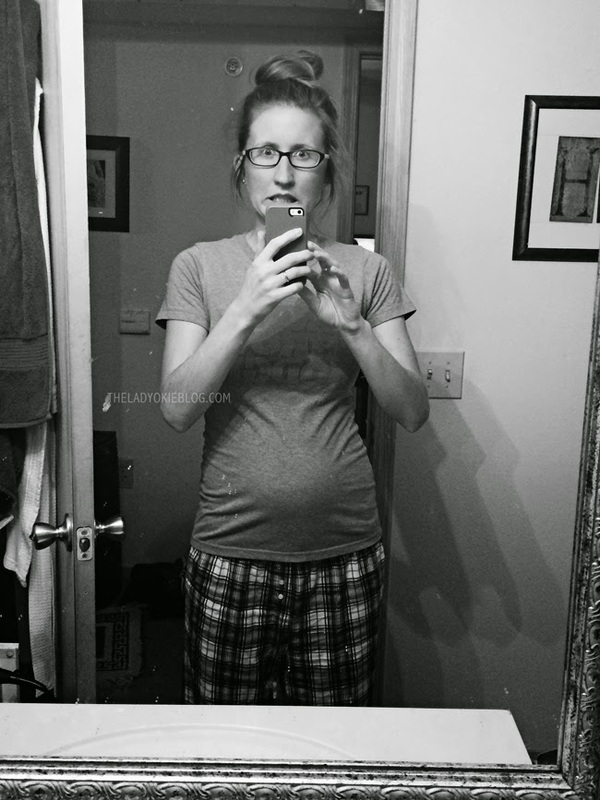 She is almost at the end of her pregnancy and her writing is hilarious and awesome, just like yours! I think you two would be friends! I just read a bunch of her posts! Love it! Can't wait to keep hearing more about this journey of yours!! I wonder why you dreamed about a possum? Dreams are weird anyways so I can't imagine a pregnancy dream adding to the weirdness of them. I used to have people ask me if I was pregnant. That never made me very happy and whatever piece of clothing I was wearing when I got asked that pretty much never got worn again. Hahaha I love this although it makes me slightly terrified for pregnancy. I love your bump! haha that's hilarious that people are staring at your stomach, i wonder if i do that when people tell me. so weird. i am not looking forward to the mood swings, i'm moody enough... my poor husband haha. possums are scary, that dream sounds terrifying! I apologize in advance, but I totally laughed about your banana-induced tears. It reminded me of when I completely lost it over having to go up an underwear size. I dissolved into a fit of hysterical tears while holding them up, showing my husband how huge they were and that I was going to be fat, pregnant, and ugly forever. He kind of just stood there like a deer caught in headlights for a minute, truly unsure of how to handle my behavior. Now we laugh about it. Good times! Also, you are not starving your baby. Baby gets all the food first, which is why you are starving. You're a good mom already! This is amazing all-around. I mean, I'm sorry you're going through it, but it certainly made for an entertaining blog post. It's probably a bad sign that I have mood swings and craziness already. Sorry, fiance. i can only imagine the process of it all - but you seem to be managing beautifully my dear! Oh my gosh...I can 100% relate to every.single.point! Seriously. I can be laughing one moment and then the tears just start falling...for no apparent reason! And I think the trips to the bathroom (which is completely across the building at my office) consume more time than I'm actually in my office doing work! Btw, CONGRATS on making an offer on a house! So much change...but everything must be so exciting! You are rocking the pregnancy! These are awesome insights. Congrats on the offer for the house!! Good luck!! I have crazy weird mood swings during that time of the month, I can only imagine the intensity of them during pregnancy! Good grief! I pity the boys for having to put up with that part of it and the random food cravings. I never really understood the food aversion thing until I was pregnant the last time. All Mike had to say was "deli meat" and I'd start to gag. I hope no one touches your belly without permission. That is irritating. I'm guilty of looking straight away at every preggo woman's belly - it's a reflex, can't help it! You look adorable with your cute little bump (yep, totally checked it out)! Good luck on the house, I hope you'll get it! Without any possums in sight. You're hilarious and this is the best. I love when people divulge weird things about pregnancy - it makes me feel less weird for not being sure if it's something I want to experience ;) I hope people stop staring at your stomach! Pregnancy or no, you should never turn down lasagna with a side of more lasagna! I laughed til I had to pee! ha. I can honestly say I didn't have any of those problems with pregnancy, but I had other ones. Constipation for months on end that required enemas. Isaac got hubby of the year award for that one. And the charlie horses! Up your potassium if that happens. And the Depends? Have them on hand for after the hospital. Just, yeah. You've got a great attitude!! I love your sense of humor through all of this! :) Now I'm second guessing myself when someone tells me they're having a baby. Do I look at their belly?! I don't know!! Also, your idea of a coffee date sounds pretty much perfect. If we lived nearby, I'd TOTALLY bring over a lasagna. oh gosh! I just realized any time anyone tells me they're pregnant I look right at their stomachs! I'll never do it again, I promise! The banana story had me laughing out loud for real. Good thing I don't share my office with anyone! I'm totally guilty of immediately dropping my eyes down to the stomach whenver someone announces a pregnancy - I can't help it! I love the belly shot! and the funny update. How did I miss that you were pregnant?! Ah! Welcome to the craziest and most awesome club in the world (the Mom club that is). Congratulations!!! ALL OF THIS. The irrational mood swings. Oh my gosh. Last week I cried before I even made it out of bed. The constant urge to pee is maddening after awhile. It's like a form of a torture. Especially when the bathroom at work is at the exact opposite end of the building from my desk. That dream is hilarious! I keep dreaming I'm giving birth to cats. And so many other bizarre dreams that I can't even type because my sanity will immediately be questioned. This afternoon someone at work asked me how much longer I have. When I said my due date is 6 days away, she kept looking at my stomach and back at my face at least three times as if she's trying to assess my size with how far along I am. Not weird at all. I cracked up at your irrational mood swing story. You have to tell that story to your kid someday. Waaaaaaait a minute---congratulations!! I'm freaking out over here and so excited for you!! I had no idea! Congrats again! Okay--so the irrationality---hilarious and SO true. I was the same way---"I'm going to keep it in check"...ha! No chance in that happening! Lol. I'm wondering if I look at people's stomachs when they announce that they're pregnant...I must. Oh, I hope I don't! :/ lol!!! You know what's worse than a weird dream? Waking up thinking that the weird dream is something that ACTUALLY happened! That happens to me so much and it kind of worries me a little bit. If we lived close enough to go for coffee, I'd definitely bring you that frozen lasagna and breadsticks. I really hope one of your friends does this!!!! Tell Jordan he's awesome for getting up with you when you're going crazy in the middle of the night!!!! Seriously...That's a great guy! I think I might be guilty of that stomach-staring thing (like a lot of your readers, apparently!). Good luck with the peeing, mood swings and weird dreams, and lovely to see you and the bump! First of all, I have been meaning to come over here and tell you congrats for a really long time! I have been reading blogs at like 4 in the morning (baby loves that 4am wakeup) so it's really hard for me to comment. BUT, I am so so happy for you! Such great news! So glad everything has been going pretty well (besides the pee issues). Yay yay yay! I didn't really feel differently the whole time I was pregnant, but I can totally relate the last one. People were so annoyed with me for waiting until like 20 weeks to tell them. It's just a weird thing to tell people. They HAVE to respond positively so it almost felt like I wanted attention or something. I'm dumb. Anyway, I never did figure out a good way to tell people!